A Plan of the Harbour of Acapulco on the Coast of Mexico. 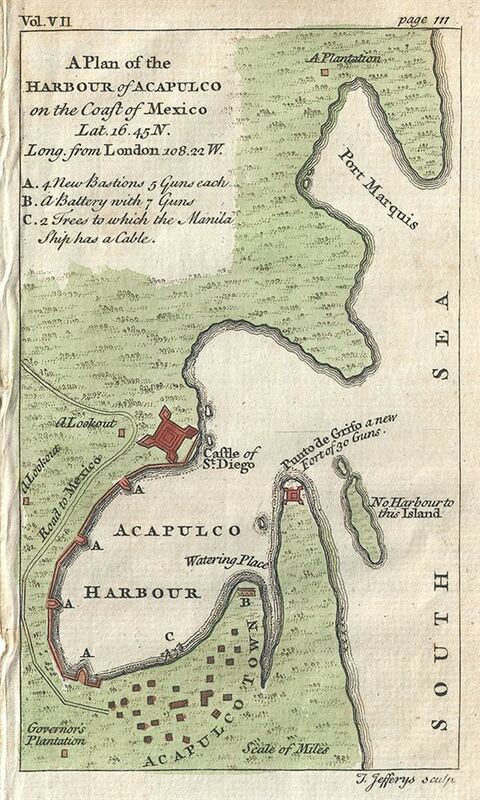 This is a beautiful c.1756 map or plan of the harbor of Acapulco, Mexico by Thomas Jefferys. Oriented to the east, the plan details Acapulco Bay and its fortified port. In the 18th century Acapulco was the strategically important starting point for all Spanish trade across the Pacific. Until Anson's capture of the Neustra Senora de Covadonga, the Spanish dominated Acapulco-Manila route was the only viable link between the New World and the rich markets of Asia. Anson captured the Spanish treasure galleon not far from Acapulco as it began its trans-oceanic voyage. The event marked the decline of Spanish hegemony in the Pacific and the rise of the Great Britain as a regional power. In preparation for his historic attack on the much larger and better armed Neustra Senora, Anson fully reconnoitered the Acapulco starting point. This map or plan was issued by Thomas Jefferys in 1756. Very good. Blank on verso. Narrow left margin.